If you’re committed to making lifestyle changes to enhance your overall health and wellness, then follow the 7 Steps to Better Health and make a pledge to yourself to implement a simple supplement program for 90 days, that’s designed to improve body chemistry, detoxify the body, support thyroid function and help promote a healthy digestive system. Although no guarantees can be made in regards to your results, this program has been created to stimulate or “jump start” your body so that it can function once again in a normal, physiologic manner. Make the commitment….. 90 days…..you’ve got nothing to lose and everything to gain! To begin this nutritional program you will want to Detox first. Begin with 1 teaspoon of the Raw Materials Detox per day, increasing by 1 teaspoon each day until you reach 2 ounces in the morning and 2 ounces in the evening. As you are increasing the dosage (detoxing) you may experience being overly tired or stomach discomfort. In this case, decrease your dosage back to the point that you were not experiencing discomfort. Maintain this dosage for a few days. then begin increasing again as directed above. After you reach 2 ounces morning and night, stay on this dosage for 3 weeks and your intial detoxing phase will be completed. Once you are fully detoxed you may use the Raw Materials Detox product as a maintenance formula decreasing your dosage to 1 ounce per day. 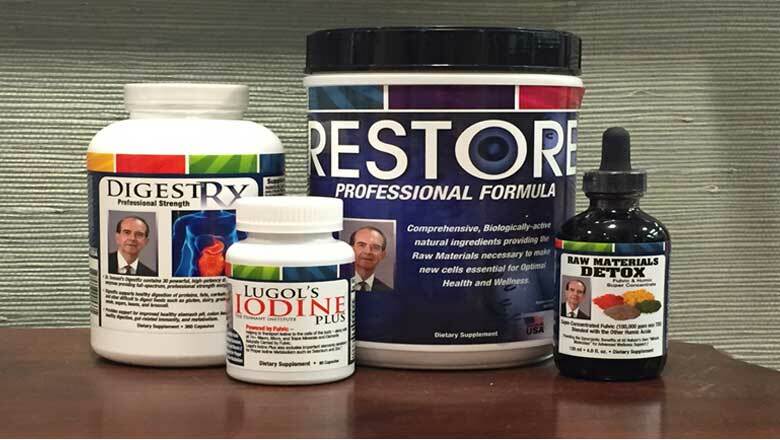 Restore is a new comprehensive product that replaces most of the nutrients patients now take. Restore comes in a powder form that includes chocolate, strawberry and vanilla flavors. Take 1 full scoop daily and mix it with any liquid (6-8 ounces) of your choice. This product can also be used as a meal replacement as it contains plenty of the proteins and good fats needed for a balanced meal. It is formulated to last for 1 month. NOTE: You may begin starting the Restore product when you begin your Raw Material Basic Formula process. You will still need to take the Lugol’s Iodine Liquid and the Digestive Enzyme Formula product daily. 2% Logol’s Iodine solution for proper thyroid functioning and cellular metabolism. 4 drops daily unless otherwise instructed by a healthcare provider. Dietary Supplement. 60 ml – 2 FL OZ. This proprietary blend of 27 powerful, high-potency digestive enzyme provides full-spectrum, professional strength enzymatic activity. DigestRX supports healthy digestion of proteins, fats, carbohydrates, fiber, and other difficult to digest foods such as gluten, dairy, grains, nuts and seeds, beans, and broccoli. Provides healthy stomach pH, colon health, healthy digestion, gut-related immunity, and metabolism. (up to 90 day supply). Once you’ve completed the 90 Days to Better Health program, it is suggested to continue the Restore Professional Formula as your daily supplement support system. This can automatically be shipped to your home on a monthly bases or it can be picked up at our office at your convenience. If we can be of any assistance or you have any questions, please let us know and we’ll be happy to help on your life changing journey to better health and wellness! Have you ever heard the expression “use it or lose it”? It’s true! If you don’t use your body, you will surely lose it. Your muscles will become flabby and weak. Your heart and lungs won’t function efficiently. And your joints will be stiff and easily injured. Inactivity is as much of a health risk as smoking! Our bodies were meant to move — they actually crave exercise. Regular exercise is necessary for physical fitness and good health. It reduces the risk of heart disease, cancer, high blood pressure, diabetes and other diseases. It can improve your appearance and delay the aging process. How often to exercise? Approximately 30 minutes of exercise daily is a good goal. That 30 minutes can come in one lump sum or in 15-minute or 10-minute intervals. People who aim to lose weight or to meet other goals may need more exercise. Vitamin C powder (as Sodium Ascorbate) is a powerful anti-oxidant that can heal and repair damaged periodontal tissues. Place 1 tsp. of powder into your water pik bowl (fill the bowl about 1/2 full with water), direct the water stream around the neck of each tooth. This will allow the Vitamin C to penetrate underneath the tissue and provide a healing remedy for your gums. You will soon notice the acute gum inflammation and tissue sensitivity reduce as this therapy is performed on a regular basis. This should be done once /day until the Vitamin C powder is gone. 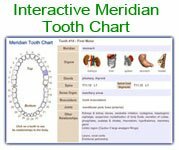 For more information on Supplements , please contact Michael G. Rehme, DDS, CCN, at 314-997-2550.